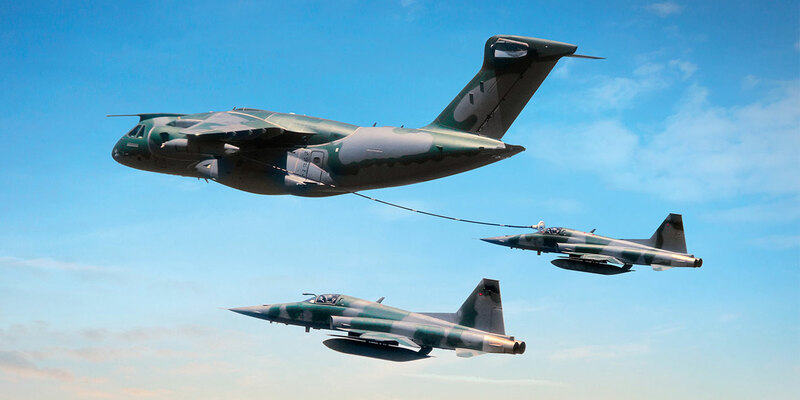 Embraer has received a Letter of Interest for six KC-390 transports, to be acquired by a company that aims to lease them out to air arms. Embraer Defense & Security has announced that it has received a Letter of Intent for up to six KC-390 multi-mission transports from aviation services company SkyTech, which intends to supply them to military customers under lease agreements similar to those employed in the commercial aviation sector. Negotiations are under way with a view to having the aircraft delivered starting late in 2020, and SkyTech envisions a potential market that could lead to further purchases. SkyTech is a new company formed by Australian charter and aviation services company Adagold Aviation and Hi Fly Transportes Aeros from Portugal. The latter operates a fleet of Airbus aircraft under its own air operator’s certificate on a range of wet and dry lease arrangements. Between them they have significant experience in operating and supporting aircraft on behalf of military forces, and have worked together on an Australia Defence Force contract under which Adagold manages the Middle East Air Sustainment Services. This program involves an Airbus A340 leased from Hi Fly flying support missions to the Gulf region. Around a year ago the two companies joined forces as SkyTech to examine further joint opportunities in the military sector, including aircraft leasing and the arrangement of services such as maintenance and training. As a result, the SkyTech venture saw a big demand for airlift, but at the same time recognized that many air arms could not afford the acquisition costs of new aircraft. Following talks with around 30 air arms around the world, the concept of the long-term lease of transport aircraft was welcomed favorably, and garnered sufficient interest to open negotiations with Embraer (Stand V01, Chalet CD31) for the KC-390. SkyTech considers that the Brazilian aircraft offers a thoroughly modern airlift capability, and a considerable performance improvement over the popular but aging C-130 Hercules, as well as great versatility for a number of tasks. SkyTech aims to acquire the aircraft in full NATO military specification, including optional inflight refueling capability, and lease them to air arms. They will remain the property of the company, but will be military-registered and operated by air force crews. Lease terms could vary, but would typically be 10, 12 or 15 years. A service provision arrangement would be entertained if a government required it, but the long-term lease offers the most attractive proposition for most potential customers. For those customers, the arrangement not only greatly reduces start-up costs by removing the acquisition element, but would also permit upgrading at the end of the lease term, with SkyTech taking the outgoing aircraft and re-leasing them to other air forces at a lower rate. Meanwhile, the original lessee could acquire a fleet of much newer aircraft, allowing the force to maintain currency with technology and refresh the operational fleet at reduced intervals compared with a traditional outright acquisition program.